PALMER'S are set to introduce the new Cocoa Butter Formula Body Scrub this month. This new scrub shall be a blend of pure cocoa butter, vitamin E, shea butter and natural crushed cocoa beans. The combination refines and polishes to reveal brighter, smoother looking skin. The new body scrub can also be used to prepare skin before applying fake tan and works wonderfully with the original Palmer's Cocoa Butter. 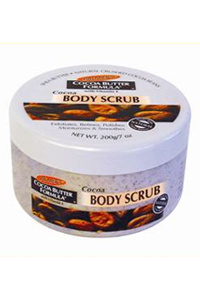 The new Palmer's Cocoa Butter Formula Body Scrub will be available from Boots priced at £4.99 for a 200g tub. Palmer's has long been a favorite winning many beauty awards for being the top body moisturiser and especially good at keeping your tan for longer after a holiday. Are you a fan of Palmer's? I am a big fan of Palmers. They are simple and often overlooked as a good beauty product but it seriously works wonders. when will u announce the winners for the giveaways? ?